We will distribute treats to you at a very low cost. 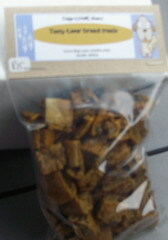 Keeping the cost to you as low as possible so that more dogs out there can enjoy tasty and healthy treats more often. We ask a minimum price of only $3 (USD) Excluding shipping cost. For South African customers please use the form provided below. The price per packet will be R20.00 excluding courier cost.